Already installed the Windows player and need to resize it? See this article. To use Enplug digital display software on your Windows desktop, follow the steps below. Please note that the Windows player supports Windows 10 only. On the Home page, in the Tools section, click the Windows Download link on the right hand side of the page. 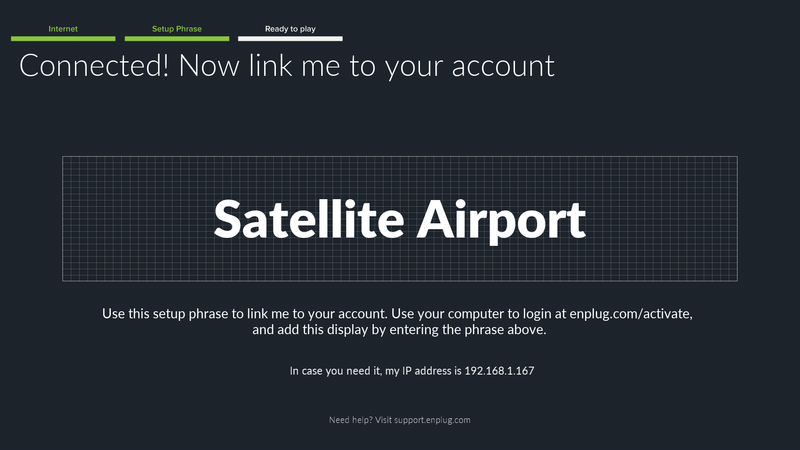 Alternately, you can go directly to enplug.com/download. In this new window, click 'Download for PC'. Once your package has downloaded, open it. When prompted to answer 'Do you want to allow the following program to make changes to this computer? ', click 'Yes'. Close the installer, then click 'OK' when prompted. You can open the application using the Enplug Display icon. This 2-word phrase is known as a Setup Phrase. You'll use it to add this display to your account. If you'd like to add the PC display to an existing display group, you'll have to select the display group, then click Add a display on the Display Settings page. For more detailed instructions, see this guide. If you'd like to create a new display group for the PC display, with brand new content, you can go to the Displays dropdown, then click Add display group. For more detailed instructions, see this article.